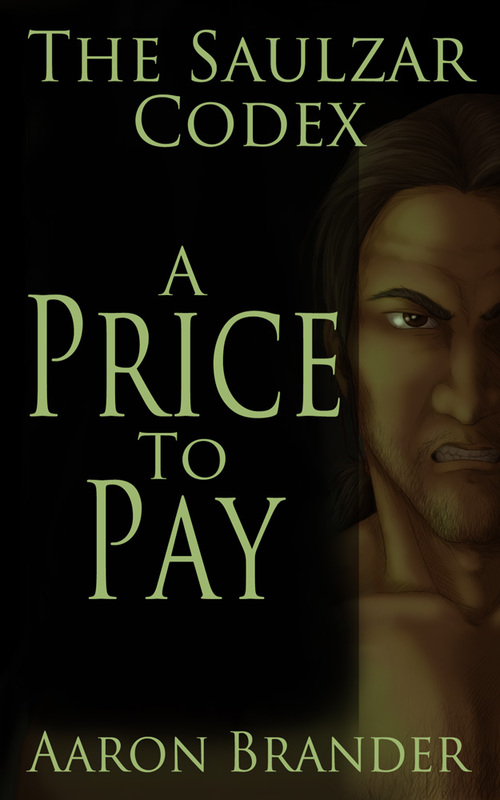 I’m happy to announce that A Price to Pay is now available! It is the first published story in the Saulzar Codex – a series of short stories focusing on Saulzar, a fierce warrior battling to overcome his own past. You can learn more about the project here. I’d love for you to stop by and pick it up. It’s a short story at 8300 words and is priced accordingly at $0.99. The next story, The Ties that Bind, will be ready to go by September 1st. The world was dull and colorless to Saulzar, though the sun was bright, the sky a brilliant blue, and reflections of white clouds danced upon the tremulous waves of the river he followed. Songbirds sang a joyous melody in worship to spring, but Saulzar did not hear. He heard only a piercing scream. The intoxicating aroma of blooming wildflowers heralded a season of bounty, but Saulzar could smell only the nauseating scent of pooling blood. He wandered south along the river Poi, unseeing and uncaring. He had no destination in mind, for he sought only to flee the horror of her death, to find release from the burden of responsibility he saw in her blue eyes as their light faded and the realization of a life cut short flashed through them. Vengeance he had sought, her death price paid in rivers of blood, but it did nothing to soothe the anguish in his soul. The mountain of dead he heaped beside her body could not bring back her warm embrace or the faint smell of jasmine when she held him close. He buried her, deep in the earth, far from the pain of the world. He built a cairn of skulls upon her grave. But the thought of her did not relent. The dying light in her eyes would not forgive him his hubris. He was haunted by her face each day and tormented in his dreams while he slept. He kept moving, if only on instinct gifted by the blood of wolves. He had lost much before her, though nothing so precious to him. He was young and strong, fierce and handsome, and possessed a skill in battle that few could match. He would persevere. He must carry his memory of her wherever he went and build a temple to her within his heart and within his mind. But it was hard. Harder than being sent from his family. Harder than surviving in the streets as an orphan. Harder than learning the ways of the Durrant Heil. The pain of her death pierced him more deeply than any wound. Yet he found a way. Day and night, night and day, through rain and sun and sleet and wind, he trudged south, the river Poi ever on his left, and mountains rising in the distance to his right. Until there was no where left to walk. The Hadean Sea stretched out before him; a gray, endless expanse of water as dark and stormy as the rage and guilt within his mind. Saulzar looked around, struggled to pierce the haze of his torment, and found himself upon a pier at the end of a town. He saw people eye him nervously and flow around him like a rock in a stream, but he paid them no heed. Could they understand the depth of his torment? Did they bear the terrible weight of Jafina’s death upon their soul? They did not. That burden was his alone. Let me know what you think of it by leaving an Amazon review or a comment on this post.